In the early 1970s, U.S. Navy SEALs and Underwater Demolition Teams got a special new weapon. The Mk. 1 Underwater Defense Gun helped combat swimmers defend themselves beneath the waves. 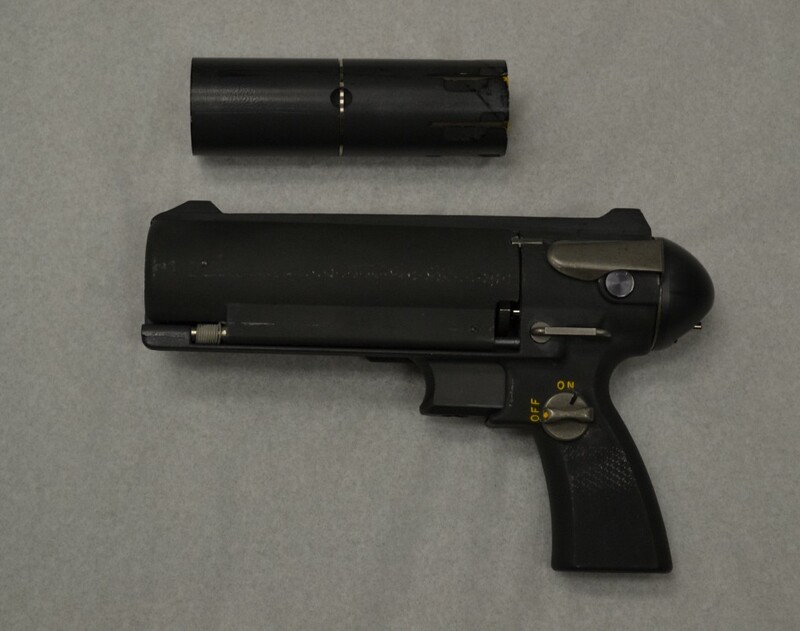 The weapon was relatively simple and even has a safety switch that just reads “on” and “off.” The pistol functioned in the same manner as a normal revolver, according to SEAL-UDT expert Kevin Dockery’s Special Warfare Special Weapons. The pistol reportedly had an effective range of some 30 feet at a depth of 60 feet. A SEAL could fire the weapon in the open air in an emergency, but with less than spectacular results. The unique ammunition is what really set the gun apart. The pistol shot tungsten darts that are about four inches long. 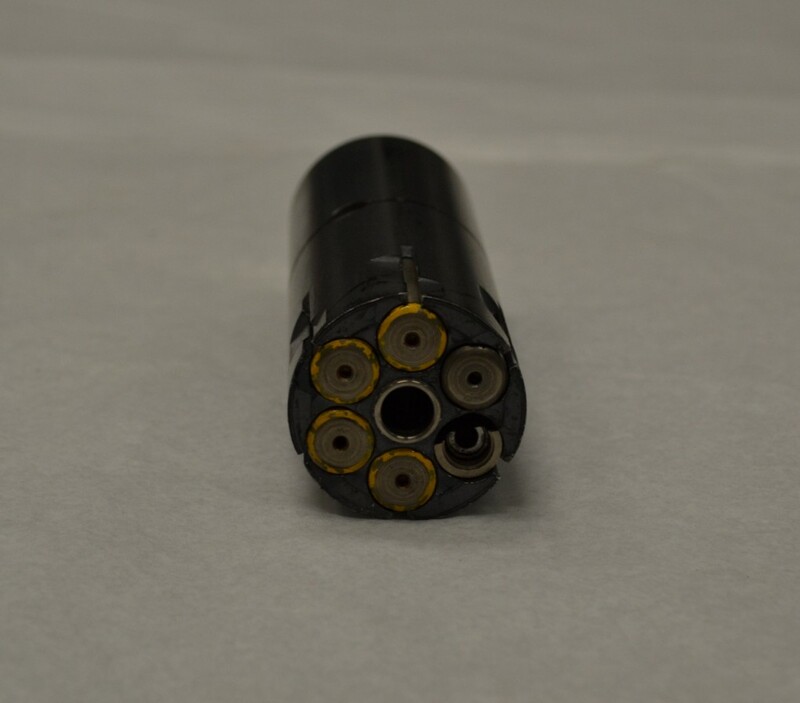 The guns held six rounds inside a large cylindrical magazine. An operator would reload the revolver by removing the entire drum and inserting another one. Each of the projectiles came packed inside a self-contained, watertight tube that also functioned as a barrel. This design meant the pistol was essentially silent below the water or on land. The gun might be better described as a “pepperbox,” according to Dockery. This early type of revolver had individual rotating barrels, each loaded with a single bullet. The sealed ammo was also a safety feature. Sound travels under water almost five times faster than it does on land. Detonating any sort of explosive charge under water can be a hazard to swimmers. Naval History and Heritage Command at the Washington Navy Yard has one of these unique weapons in its collection. NHHC also possesses one of the ammunition magazines with six spent cartridges in its vaults. Of course, the idea of a revolver capable of firing darts underwater does sound like something out of a James Bond movie. But the Navy had practical concerns. Frogmen historically have hidden under the sea in order to sneak into enemy ports and other facilities. Traditionally, combat swimmers were also tasked with preventing enemy divers from doing that very thing. Regular guns do not function well under water despite what blockbuster movies might have you believe. Without a specialized weapon, SEALs would have to rely on knives in an undersea tussle. The sailing branch wasn’t alone in developing subsurface small arms. The Soviets gave their divers dart-firing underwater assault rifles and pistols. However, the Underwater Defense Guns appears to have had a short lifespan. In 1976, the Navy’s commandos began replacing them with a similar German weapon from manufacturer Heckler and Koch. We don’t know if the SEALs are still using that P11 underwater pistol. The sailing branch could easily have developed a new weapon to protect commandos under the sea. You can follow Joe Trevithick on Twitter at @FranticGoat. Sign up for a daily War is Boring email update here. Subscribe to WIB’s RSS feed here and follow the main page here.